To drink one of the best Ontario-brewed beers in recent memory, you’ll likely have to get out of town. Silversmith Brewing recently won a gold medal at the Ontario Brewing Awards for its Black Lager, a German schwarzbier whose look belies a light, crisp and refreshing taste. But one of the only ways to drink a Silversmith beer is to actually visit Silversmith in Virgil, Ont. On tap at only 100 bars – with all but 10 outlets in the Niagara region – they won’t be found in the Beer Store or LCBO. Silvermith is located on a stretch of highway leading to Niagara-on-the-Lake. The region is most famous for wine, but it has seen a boom in craft brewers reaping the benefits of tourism during summer months. An estimated two million people visit the area every year. But once the cold and snow hits the QEW from Toronto, these breweries survive – and thrive – as hyper-local community generators, tapping into their own regional histories. In Virgil, the Silversmith space has ambience and atmosphere in spades. Built from a former Anglican church erected in 1894, it was turned into a beer hall in 2011 by Mr. Swan’s team. There are seasonal beers, of course, such as this weekend’s release of Devils & Details, a winter-warming 9-per-cent Belgian golden ale. But it is innovative events and shows that ingratiate the brewpub to the town of 2,300 people. They have live music every Thursday and Sunday. And on Feb. 17, they host another edition of Dinner Deconstructed, a dinner party where butcher Jamie Waldron gives a seminar with one half of an animal while chef Jonny Blonde is in the kitchen cooking the other. But to keep the regulars coming when the tourists have gone home, the hayloft at Oast was converted to a hip event space to keep the taps flowing. They’ve teamed with the El Gastronomo Vagabundo food truck to offer a menu in the hayloft on weekends to go with a rotation of live bands. 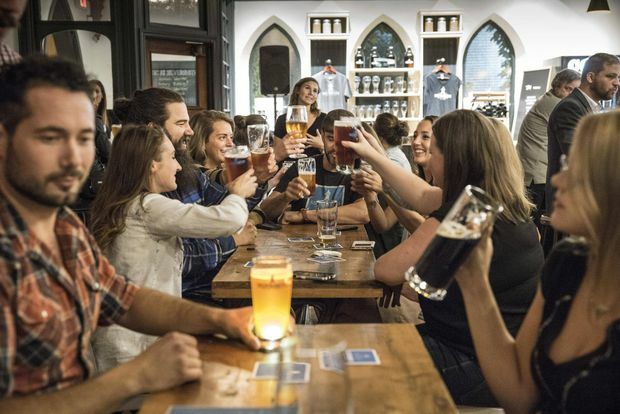 In Ridgeway, on the southern edge of Niagara, Brimstone Brewing Co. is but one piece of a community hub that has transformed a former church into the Sanctuary Centre for the Arts. While beer is made and drunk in the brewpub downstairs, the Fort Erie Arts Council operates a gallery and event space on the upper floor, where art happenings, live music, Zumba classes, psychic fairs, weddings and “tap ‘n’ taste” dinners happen year round. This weekend, it hosts a fundraiser for Spencer MacKenzie, a young local musician trying to cover travel costs for a blues competition in Memphis, Tenn.
Brimstone co-founder Rob Daigle says they are still “in the middle of the young upstarts” in the industry. While Brimstone beer can be found in a few LCBOs, it’s the brewery’s local contributions that have made it successful so far, even winning a Fort Erie Chamber of Commerce Emerging Business of Excellence Award for its efforts. If there is a strong indicator that craft-beer tourism is here to stay, look toward Niagara Falls. Owned by Canadian Niagara Hotels Inc., the Niagara Brewing Company opened last June as part of its hotel and entertainment complex at the foot of Clifton Hill.